Reading over Deetz’s work again, I was struck by how similar their suppositions are to the likes of this fascinating little tome, written in 1977: A Pattern Language. A Pattern Language, by Christopher Alexander, et al. is an effort to catalog the architecture of Western human lives. It Identifies 253 patterns which can be combined in a variety of ways to create pleasing homes, towns, and worlds. The book is divided into three sections; a pattern is appropriate for either Town, Building or Construction. The patterns are grouped into as conceptual nodes. The patterns in these nodes interrelate and are interdependent. Strung together, the implementation of these patterns form a spatial sentence. The space is afforded a coherence–a way to communicate welcome. 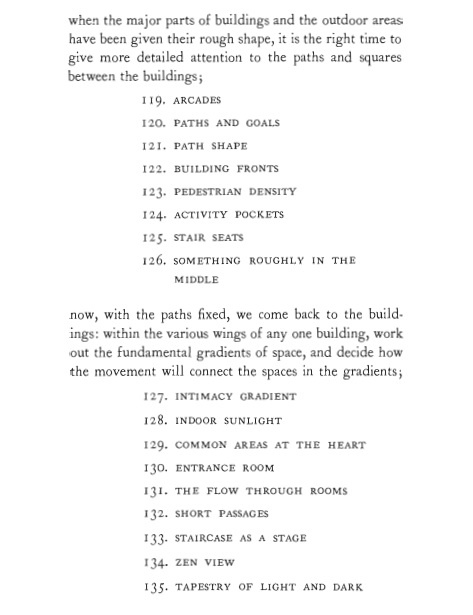 A Pattern Language is more than woo-woo 1970’s social engineering through Western architectural rulebook; using these classifications as scaffolding, the book bestows grammar and syntax onto something as abstract as space. 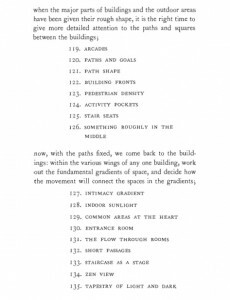 While Deetz uses architectural patterns to draw conclusions about how people lived in the past, Christopher Alexander and co. lists these patterns to suggest ways for individuals and groups to live in the future. Interestingly, the authors assert that these patterns are “timeless” (the first book in the series is actually called A Timeless Way of Building). While these patterns are definitely not universal (there’s a little too much talk about chairs and parking for that to be true), it’s worth interrogating whether all of these patterns necessarily result in pleasing public and private spaces, even when we limit our vantage to a Western context. It’s worth at least a skim; it’s also good for decorating tips–because who doesn’t admire pattern #204, A Secret Space, or pattern #247, Paving With Cracks Between the Stones? This entry was posted in Sources of Inspiration by red0. Bookmark the permalink.